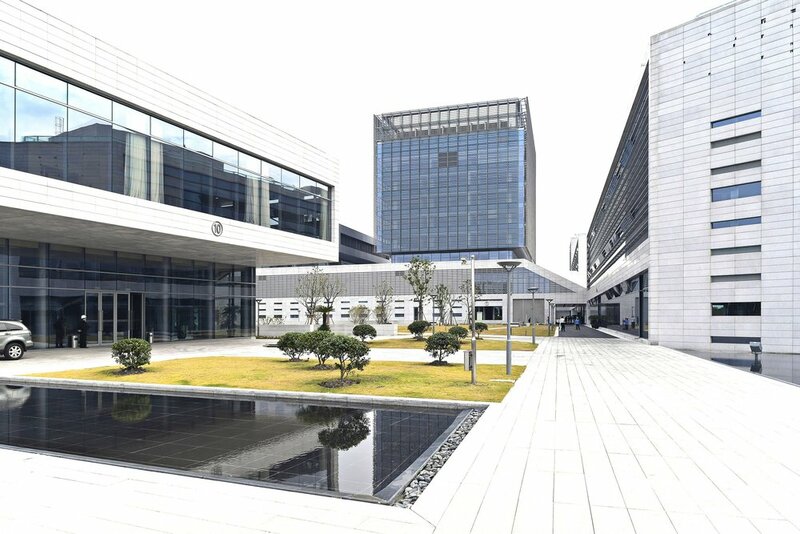 The agency's second technology campus for the Zhang Jiang High-Tech Park, situated about 21km from Pudong, is imagined as a sort of digital fortress. The complex includes roughly 12500m² of data server rooms, with these spaces forming the foundation upon which rest other programmatic zones, such as offices, customer service centers, restaurants, and conference centers. The buildings are grouped around two distinct courtyards, one which is more open and faces the main city entrance, and the other which is reserved primarily for building occupants and is therefore more intimate. The more privatized courtyard is directly associated with the users of the data processing center complex, a highly-protected building. The complex’s aesthetic reinforces the idea of protection through the use of local stone cladding, which makes up the ground surfaces and pathways and building façades.